La notte rosa | Light Your Nails! Pronte per il week-end? Qui a Rimini si preannuncia il pienone dato che è il fine settimana della Notte Rosa. Potevo non accodarmi alla folla con una nail art? Ma che riminese sarei? Su, su, non scherziamo! Ecco la mia proposta per questi due giorni particolari! Forse riconoscete lo smalto di base, che vi ho mostrato a inizio settimana: P2 Pink Pearl (Easy Gel). Anche lo smalto che ho usato per stampare l’avete già visto, si tratta infatti del BornPretty holo 23#. La plate è la BP-83, anche lei da BornPrettyStore. Il risultato mi piace tantissimo quindi sventaglierò ben fiera le mie unghiette da week-end! ready for week-end? Here in my city there is a special event tonight and tomorrow, called “La notte rosa”, the Pink Night. It’s actually a bigger event than my city only. I live by the beach and all along the 170km seashore (105 miles) there will be lots of stuff going on: concerts, theatre, fireworks (pink only!) and what not. Everything lasts from evening to the next morning. Everyone is wearing something pink and I obviously went for a pink nail art since I realized I have no pink Summer shirts. This is my special manicure! Maybe you can recognise the nail polish I used as a base: P2 Pink Pearl (Easy Gel). The one I’ve used for stamping is not new on the blog either, it’s BornPretty holo 23#. 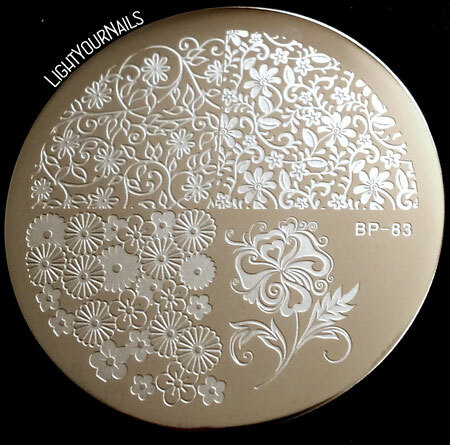 Stamping plate is BP-83, also from BornPrettyStore. I love the final look and I will show my nails around for sure! Che mi dite? Vi piace? E voi che piani avete per questo week-end? Magari qualcuno di voi farà una scappata in Riviera per l’occasione, o per il raduno Ducati a Misano (e in quel caso, tutti in rosso!). Fatemi sapete, e in ogni caso passate un bellissimo fine settimana d’estate! What do you think about my pink manicure? And what plans do you have for this week-end? Whatever you’re doing I wish you a great Summer one! Thank you for your comment Rosangela, sorry I don't publish links. First of all; you nailed the monotone stamping, I love it!!!! Second; a holiday that's all about pink?! YES PLEASE! Second time ever I get it look good haha! It's not a holiday, only an event they organize every year the first week-end of July! What a beautiful monochromatic mani!! Lovely! A Pink holiday?!!?!? !😍 Great mani to celebrate! Such a beautiful design! Love the colors you used too!